Anthea D. Butler. Women in the Church of God in Christ: Making a Sanctified World. Chapel Hill: University of North Carolina Press, 2007. ISBN 987-0-8078-5808-0. Laura R. Olson, Sue E. Crawford, and Melissa M. Deckman. 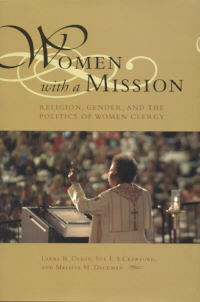 Women with a Mission: Religion, Gender, and the Politics of Women Clergy. Religion in American Culture. Tuscaloosa: University of Alabama Press, 2005. ISBN 987-0-8173-1460-1. Reviewed by Kelly J. Baker, for the Journal of Southern Religion. In The Religious History of American Women, Catherine Brekus argues for the inclusion of women's history into larger narratives of American religious history. For Brekus, "many historians have written as if only male leaders�and a small number of elite female leaders, usually white Protestants�have had the political, economic, or religious power to bring about change. "(1) These large, or perhaps grand, narratives of American religious history (as well as American history), in some ways, have remained impervious to the religious lives of women and their impact on their congregations, religious leaders, families, and wider social worlds. Unfortunately, the presence/influence of women has been overlooked, willfully ignored, or, perhaps, discounted as somehow unimportant because women have not historically gained entrance into leadership roles within their religious communities. Women have more often been the "people in the pews" rather than people of the pulpit. Some women have gained access to religious leadership, and they appear sprinkled in narratives as unique case studies or forerunners to change. In her work, Brekus and her contributors sound the call for inclusion as well as the embrace of women's history in religious history. How do our narratives change or remain the same with the entr�e of women? What kind of stories bubble to the surface rather than remain hidden in the depths? Anthea Butler's and Laura Olson et al's works, in some ways, provide answers to this charge. Both Women in the Church of God in Christ and Women with a Mission present case studies of women's leadership primarily in Christianity (though Olson's work includes Reform and Conservative Judaism). These both examine how women become leaders, their styles of leadership, and how they understand their particular circumstances. Both works present a complicated relationship between gender and leadership that for historical actors and contemporary clergy can be fraught with tension, can provide empowerment, and can reify traditional gender norms. Despite the optimism about the influence of female clergy on larger society, the authors note that these clergywomen face pressure from their congregations not to be overly political. Additionally, their choices for action might have been toned down. Instead of fighting against discrimination (especially gender or sexual), these clergy might focus upon poverty. Many of the clergy interviewed did not shy away from controversial issues, and, instead, took action in their congregations and communities. Women clergy, the authors conclude, are more "left-leaning" than their male colleagues, but they tackle these problems in the local arena (138). In conclusion, the authors point to further areas of research including female leadership in evangelical and Pentecostal circles as well as examination of the clergy-laity "gap." What proved striking to me was the assertion that with more women entering religious leadership, "gender-based discrimination ought to diminish," which I consider to be an exaggerated claim (146). The authors appear optimistic about the potential of female clergy to influence larger society as well as their congregations, but I am not sure I am convinced by this argument about influence. First, many of the denominations they document are losing rather than gaining membership (a point the authors recognize) while Pentecostalism continues to grow dramatically. Second, the female clergy they interviewed belong to historically more "left-leaning" traditions, so it was not surprising to me that they proved to be more liberal. I think the portrait of female leadership would have had different colors if the authors had included women in leadership in more conservative traditions. These women might not have been more liberal than their male colleagues, but more importantly, these women, in spite of political leanings, were likely taking action on some similar issues, including poverty and family. However, on issues of sexuality and gender, their positions would have diverged. As far as gender-based discrimination, I am not sure an influx of female leaders cures the problem. Even in an era of a possible female nominee for president, Hilary Clinton, gender discrimination appears alive and well. Female leadership does not necessarily equate with lack of discrimination, and female leaders might contradict stereotypes about their leadership styles. This, however, does guarantee an open embrace of women in various religious traditions or in the larger political arena. In Women in the Church of God in Christ, Anthea Butler examines female leadership in the Women's Department of the Church of God in Christ (COGIC) and the significance of church mothers in the historically African American denomination. In particular, Butler presents the attempts of church mothers to gain "spiritual empowerment" via 'the sanctified life' (3). This 'sanctified life' allowed women "the moral, spiritual, and physical fuel that enabled them to negotiate for and obtain the power both within the denomination and outside of it" (3). To present this case study of the church mothers of COGIC, Butler counters two common narrative tropes about the religious lives of African American women. First, by using sanctification, she turns away from discussions of "racial uplift," which focus on the advancement of the race and often downplay religious motivations. Second, she aptly demonstrates that sanctification does not necessarily mean disengagement from secular society. Rather, it implies spiritual practice that is applied to the world around them. What becomes clear is that women became the physical embodiment of sanctification for COGIC, and thus, the symbols of the church's embrace of this lifestyle. Sanctification, according to Butler, was related to John Wesley's doctrine of 'Christian Perfectionism,' which related to a state after one's conversion in which a convert could "pursue the pathway to perfection" (19). For COGIC women, sanctification meant their bodies might be healed of illness and made clean, which meant their bodies must remain pure. Cleanliness implied moderation in food and avoidance of alcohol (20). Their bodies had to comport to this lifestyle, which was also reflected in modest dress. Sanctified bodies, however, did not equal ordination for women. Instead women pursued leadership primarily through education. Relying upon their roles as mothers, COGIC women claimed the right to teach, instead of preach (though some attempted this as well). "Motherhood was a spiritual tool to be employed in the work of God and denomination, and these women deployed it well." Despite their lack of access to leadership, these women were responsible for church planting and the creation of schools as well as civic engagement. Motherhood was a spiritual tool to be employed in the work of God and denomination, and these women deployed it well. What proved most interesting to me is that in spite of the large role of church mothers in the development of the southern-born denomination, women bore the burden of sanctification more than their male brethren. Women's bodies were disciplined in dress, sexual norms, and worship. Prohibitions against decoration and restrictions about clothing served not only to present a sanctified form, but also to counteract negative stereotypes against African Americans, especially the sexuality of African American women. Moreover, fashionable dress might present a gender-confused body. For members, "the Spirit could not move into a body that was 'confused' about its gender identity," which meant that women policed the clothing of other women to guarantee one could become sanctified (79). Additionally, dress was the preferred method of controlling men's sexual behavior. By dressing modestly, COGIC women differentiated themselves from prostitutes and appeared "respectable" (80-81). For Butler, dress is also the signal for changes within the denomination. Restrictions of dress emphasized the importance of self-sanctification, and the embrace of more fashionable attire signaled the engagement of church mothers with the larger world. To become civically engaged, these women had to retire plain dress and be "a smartly dressed, well-coiffed and well versed church mother with a vocabulary steeped in scripture yet attuned to the social realities on earth, rather than heaven" (136). The evolution of the Women's Department from 1911 to the 1960s could be traced sartorially. Their dress signaled their spiritual concerns, and their clothing shifted from a material artifact representing inner purity to smart clothing that symbolized a concern with the larger world. For Butler, by the 1970s, clothing had been stripped of much of its religious meaning, and well-dressed women were no longer engaged, but submissive to the commands of male leadership. Women's leadership was on the decline, no matter what their clothes suggested. Female leadership in COGIC contained peril as well as promise, and women gained tenuous power that always had the threat of being taken away. Butler's narrative appears quite different from the narrative of Olson, Crawford, and Deckman. The women clergy in Olson's work can preach as well as teach. They lead congregations and take political action of their own choosing. They faced opposition, and some faced discrimination, but the narrative provides overweening optimism. For the three authors, women clergy can change the world. They admire these women and even dedicate the book to them. What is missing from Women with a Mission is an understanding that women leaders don't all face such optimistic endeavors. By defining female leadership so narrowly, they miss what Butler so aptly points out. The church, broadly defined, is not always about redemption for women in the pulpit or in the pews. The women, the church mothers, of COGIC gained power and empowerment, but these proved to be fleeting. They were leaders, but not ordained. By defining leadership by ordination, Women with a Mission presents a very different portrait of women's religious lives than Women in the Church of God in Christ. By reading the two together, it became apparently clear that examining or generalizing women's experience is a difficult endeavor, but harkening to Brekus's call, this work is much needed to understand how different our histories appear if we include the triumph, frustration, and the ambivalence of women in leadership roles. Moreover, I think Butler's statement should function as a warning. We can like our historical actors or our conversants, but we also need to be willing to analyze what they say and do to document the complexity of their stories. Liking them does not mean we should ignore abusive tendencies, nor does it mean we should glorify their positions. To document women's leadership among various religious movements requires expansive definitions, preachers as well as teachers. This would demonstrate the diversity of positions among religious women as well as recognize their foundational roles in the lives of their congregations. They might not have had access to ordination but they did lead. By answering Brekus's call, we get a glimpse of how rich our narratives could be if women's voices are heard. Whether preachers or teachers, they wield some influence. 1. Catherine A. Brekus, ed., The Religious History of American Women: Reimagining the Past, (Chapel Hill: University of North Carolina Press, 2007), 17.